In anticipation of his co-presentation at eMetrics Summit in San Francisco, April 3-6, 2016, we asked Matthieu Dejardins, CEO and Founder of NextUser, a few questions about pursuing digital marketing efficiency and effectiveness. Check out his interview in relation to his eMetrics Summit co-presentation entitled, A Quick Guide to the Future of Digital Analytics. Q: Where does digital analytics sit in your organization and how does it interface with your business units? A: At NextUser, Digital Analytics is really at the center of strategy. We see from our clients that their organizations are operationally siloe’d and the same goes for their marketing systems. Data is mainly used in periphery of their marketing applications while it should be the engine driving all marketing touch points to contextualize the user experience. We succeed using thought leadership techniques, which generally consists of a Google Analytics study of 50-60 pages to convince the GM, CMO or CRM division. The difference with traditional Web Analytics firms is that we don’t stop at the analysis-level. In fact, we use their existing data to assess the size of segments and convince business units of the potential of 12-15 multi-channel personalization scenarios (website, mobile, email, SMS, pro-active customer support tickets and more). Q: What was the most valuable thing you learned in 2015? What’s the most important goal/trend for digital analysts to keep in mind in 2016? A: In 2015, we saw a lot of companies embrace Big Data by having their DMP or database enriched by Google Analytics Premium. While it’s demultiplying their possibilities, they realize quickly that it’s just the beginning of the game. It’s also driving to a data paralysis, as they need to act on the insights they are now able to uncover. In 2016, we think that independent open platforms will start emerging and progressively take over big marketing clouds like Adobe, Salesforce and Oracle. The marketing clouds are a sweet mix of separate acquisitions that were not designed to be connected to each other. Leveraging marketing connectors (API), there is now an opportunity to have a marketing middleware to orchestrate your communications channels like a maestro would do it with its musicians. Q: What’s the latest analytics method/process/tool set that you have implemented and what advice would you give others? A: In the past months, we have invested a lot of time in associating Predictive Analytics and user clustering with Artificial Intelligence. It’s just the beginning, but there is a huge opportunity to use this new data for contextualization purpose by detecting the user’s personality and the voice of the customer based on review websites or social media. Imagine that we could explain why people are behaving in a particular way online and we thus are able to adapt to their current emotions! Selected by IBM Watson at the Consumer Electronics Show in Las Vegas, NextUser was a finalist from among 2,000 competitors for the Extreme Tech Challenge to demonstrate the future of Artificial Intelligence to Sir Richard Branson at Necker Island in February 2015. We are now on our third generation of Personality Insights and the second of Voice of the Customer and we’re currently deploying that for our early adopter clients. Q: What do you wish you could tell your five-years-ago self about this industry? A: The only constant is change. More seriously, with IoT, Digital Analytics are now everywhere based on any type of data at the point of decision or action. So, it translates into the organizations with a clear switch from IT Departments who historically owned the system of record to the business units who are looking for systems of differentiation, which can provide both a low-level of integration and some analytical agility. It’s opening plenty of opportunities for new categories of analytic applications (e.g. Credit risk, Merchandising, Sales Performance, Search) that are acquired progressively by the tier 1 vendors mentioned earlier. Q: Sneak preview: Please tell us a take-away that you will provide during your talk at the eMetrics Summit. A: NextUser processes customer activity, history, device, demographic, and geographic data like any analytical tool. Now, we can also leverage linguistic analysis to produce results with both cognitive and social characteristics to answer not only the usual “what happened,” but rather the far more insightful “why did it happen?” Generally speaking, a partnership with IBM Watson allows us to offer a new and unique way of segmenting the users, which provides a much richer context than just clickstream/purchase, and other behavioral data. Understand the echo from the voice of the customer and easily solve problems for a greater satisfaction. 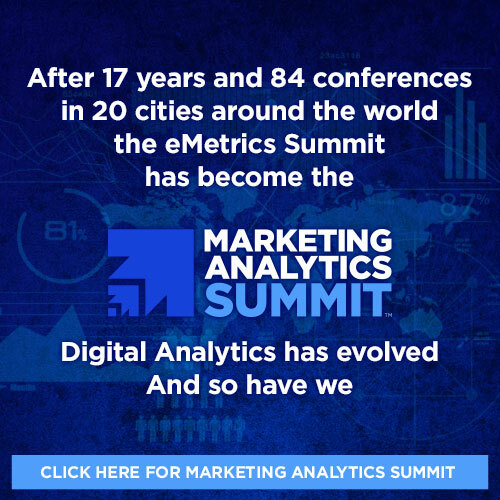 Don’t miss Matthieu’s presentation, A Quick Guide to the Future of Digital Analytics, at the eMetrics Summit on Tuesday, April 5, 2016, from 3:30 to 4:15 pm. Click here to register for attendance.